Muehrcke lines are paired, white, transverse lines that signify an abnormality in the vascular bed of the nail. Muehrcke first described paired, narrow, white, transverse fingernail lines in a series of 65 patients with severe, chronic hypoalbuminemia. He believed that the lines, as shown in the image below, were a specific sign of this single biochemical alteration. Others described patients receiving multiple cytostatic agents. These nail alterations may also represent an example of chemotherapy-induced nail changes. Muehrcke lines represent a type of apparent rather than true leukonychia, as they involve abnormal nail bed vasculature, which alters nail plate translucency. The whiteness becomes unapparent with pressure and is not modified by nail growth. Note the image below. Close-up view of 4 fingers. White horizontal bands are evident. Transverse white lines of the nails occur with many different etiologies. They have been shown to occur in association with several conditions, including pellagra,  Hodgkin disease,  renal failure,  sickle cell anemia, or nail damage from paraquat. See Pellagra, Hodgkin Disease, Acute Renal Failure, Chronic Renal Failure, and Sickle Cell Anemia for more information on these topics. Muehrcke  observed the fingernails of 250 healthy adults, 500 patients with serum albumin levels in the reference range (values < 4 g/100 mL were taken as abnormal), 31 patients with nephrotic syndrome, and another 34 patients with hypoalbuminemia from other causes. The paired, white bands were not found in any healthy subjects or in patients with serum albumin levels of greater than 2.2 g/100 mL. Of the 31 patients with nephrotic syndrome, 23 (74%) had paired, transverse, white bands. Of the other 34 patients with hypoalbuminemia, 9 had serum albumin levels of less than 2.3 g/100 mL, 8 of whom developed the white bands. In 1 patient with a serum albumin level of 2 g/100 mL, the bands did not develop; however, her albumin level had decreased from 2.7/100 mL in the previous 2 weeks. The bands were more prominent in patients with albumin levels of less than 1.8 g/100 mL for at least 4 months. Reporting on the reliability of Muehrcke lines as a sign of hypoalbuminemia, Conn and Smith  observed the development of transverse, white bands in 10 patients, all of whom had serum albumin values of less than 2.7 g/100 mL. Muehrcke lines were present in 10 (23%) of 44 patients with low albumin levels and with a variety of debilitating illnesses, but the lines were not observed in any patients with normal albumin levels. More recently, Nabai  reported the appearance of white bands on the nails of a patient with hypoalbuminemia who had undergone a heart transplant. A month after the surgery, certain features of Muehrcke lines were noticed on both thumbnails and subsequently on other fingernails; the albumin level was reported at 3.6 g/mL. Even after the albumin levels returned to the reference range, the bands lasted for another 2 months. Although these changes in the nails apparently resembled Muehrcke lines, features of the presentation differed from Muehrcke's original description. Muehrcke lines typically appear on the second, third, and fourth fingers; however, in this case, the bands appeared on all of the fingers in addition to the toenails (the bands were more pronounced on the fingernails). Additionally, the lines appeared and persisted at albumin levels of greater than 3.4 g/100 mL compared with levels of less than or equal to 2.2 g/100 mL as described by Muehrcke. This case was the first report of transverse, white bands in a patient with a heart transplant. In 1976, Nixon  described a patient with a glioblastoma who was receiving therapy with procarbazine hydrochloride, vincristine sulfate, and carmustine; this patient subsequently developed broad, white bands on the proximal half of the nails after 3 months. According to Nixon,  transverse pigmented bands are the more common nail alteration seen with cancer chemotherapy, and these changes are not associated with the changes in the nails seen with systemic disease. Schwartz and Vickerman  reported the appearance of paired, white, transverse lines on the nails of a woman with squamous cell carcinoma of the left main-stem bronchus. She was treated with a combination of platinum, doxorubicin hydrochloride, vincristine sulfate, and methyl cyclohexylchloroethylnitrosurea (CCNU). Schwartz and Vickerman  referred to these bands as Muehrcke lines; however, as they pointed out, the woman did not have persistent hypoalbuminemia. Within 1 day of the patient noticing 2 transverse, narrow, paired, white bands on each fingernail, her serum albumin level was at 3.4 g/dL (reference range, 3.5-5 g/dL). Evidently, chemotherapy and possibly other conditions should be considered as potential causes of paired, transverse, pigmented bands on the fingernails. It was been described in an infant,  although most patients with it are much older. Muehrcke RC. The finger-nails in chronic hypoalbuminaemia; a new physical sign. Br Med J. 1956 Jun 9. 1(4979):1327-8. [Medline]. Schwartz RA, Vickerman CE. Muehrcke's lines of the fingernails. Arch Intern Med. 1979 Feb. 139(2):242. [Medline]. Lipner SR, Scher RK. Evaluation of nail lines: Color and shape hold clues. Cleve Clin J Med. 2016 May. 83 (5):385-91. [Medline]. Brownson WC. An unusual condition of the nails in pellagra. South Med J. 1915. 8:672-5. Shahani RT, Blackburn EK. Nail anomalies in Hodgkin's disease. Br J Dermatol. 1973 Nov. 89(5):457-8. [Medline]. Hudson JB, Dennis AJ Jr. Transverse white lines in the fingernails after acute and chronic renal failure. Arch Intern Med. 1966 Feb. 117(2):276-9. [Medline]. Samman PD, Johnston EN. Nail damage associated with handling of paraquat and diquat. Br Med J. 1969 Mar 29. 1(5647):818-9. [Medline]. Daniel CR, Sams WM, Scher RK. Nails in systemic disease. Nails: Therapy, Diagnosis, Surgery. 2nd ed. Amsterdam: Elsevier Health Sciences; 1997. 219-50. Conn RD, Smith RH. Malnutrition, myoedema, and Muehrcke's lines. Arch Intern Med. 1965 Dec. 116(6):875-8. [Medline]. Nabai H. Nail changes before and after heart transplantation: personal observation by a physician. Cutis. 1998 Jan. 61(1):31-2. [Medline]. Morris D, Aisner J, Wiernik PH. Horizontal pigmented banding of the nails in association with adriamycin chemotherapy. Cancer Treat Rep. 1977 May-Jun. 61(3):499-501. [Medline]. Pratt CB, Shanks EC. Letter: Hyperpigmentation of nails from doxorubicin. JAMA. 1974 Apr 22. 228(4):460. [Medline]. Priestman TJ, James KW. 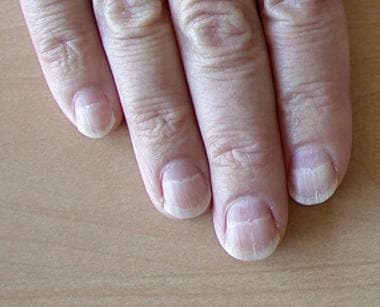 Letter: Adriamycin and longitudinal pigmented banding of fingernails. Lancet. 1975 Jun 14. 1(7920):1337-8. [Medline]. Shetty MR. Case of pigmented banding of the nail caused by bleomycin. Cancer Treat Rep. 1977 May-Jun. 61(3):501-2. [Medline]. Yagoda A, Mukherji B, Young C, Etcubanas E, Lamonte C, Smith JR, et al. Bleomycin, an antitumor antibiotic. Clinical experience in 274 patients. Ann Intern Med. 1972 Dec. 77(6):861-70. [Medline]. Falkson G, Schultz EJ. Skin changes in patients treated with 5-fluorouracil. Br J Dermatol. 1962 Jun. 74:229-36. [Medline]. Goldman L, Blaney DJ, Cohen W. Onychodystrophy after topical 5-fluorouracil. Arch Dermatol. 1963 Nov. 88:529-30. [Medline]. Katz ME, Hansen TW. Nail plate-nail bed separation. An unusual side effect of systemic fluorouracil administration. Arch Dermatol. 1979 Jul. 115(7):860-1. [Medline]. Shelley WB. Onycholysis due to topical 5-fluorouracil. Acta Derm Venereol. 1972. 52(4):320-2. [Medline]. Harrison BM, Wood CB. Cyclophosphamide and pigmentation. Br Med J. 1972 May 6. 2(5809):352. [Medline]. Shah PC, Rao KR, Patel AR. Letter: Cyclophosphamide-induced nail pigmentation. Lancet. 1975 Sep 20. 2(7934):548-9. [Medline]. deMarinis M, Hendricks A, Stoltzner G. Nail pigmentation with daunorubicin therapy. Ann Intern Med. 1978 Oct. 89(4):516-7. [Medline]. Victoroff VM. Transverse white lines in the fingernails induced by combination chemotherapy. Arch Dermatol. 1993 Sep. 129(9):1217-8. [Medline]. di Meo N, Longone M, Retrosi C, Zalaudek I. Drug-induced longitudinal melanonychia and transverse muehrcke's lines. J Eur Acad Dermatol Venereol. 2018 May 6. [Medline]. Nixon DW. Alterations in nail pigment with cancer chmotherapy. Arch Intern Med. 1976 Oct. 136(10):1117-8. [Medline]. James WD, Odom RB. Chemotherapy-induced transverse white lines in the fingernails. Arch Dermatol. 1983 Apr. 119(4):334-5. [Medline]. Feldman SR, Gammon WR. Unilateral Muehrcke's lines following trauma. Arch Dermatol. 1989 Jan. 125(1):133-4. [Medline]. Monteagudo B, Cabanillas M, Suarez-Amor O, Martinez-Calvo L, Grana-Suarez B. [Muehrcke's lines on nails after docetaxel/cisplatin/fluorouracil]. Gastroenterol Hepatol. 2009 May. 32(5):381-2. [Medline]. Chávez-López MA, Arce-Martínez FJ, Tello-Esparza A. Muehrcke lines associated to active rheumatoid arthritis. J Clin Rheumatol. 2013 Jan. 19(1):30-1. [Medline]. Williams V, Jayashree M. Muehrcke Lines in an Infant. J Pediatr. 2017 Jun 5. [Medline]. Modesto dos Santos V, Sugai TA, Cezar BF, Vasconcellos de Rezende AC. Transverse leukonychia: a case report. West Afr J Med. 2005 Apr-Jun. 24(2):181-2. [Medline]. Robert C, Sibaud V, Mateus C, Verschoore M, Charles C, Lanoy E, et al. Nail toxicities induced by systemic anticancer treatments. Lancet Oncol. 2015 Apr. 16 (4):e181-9. [Medline]. Daniel CR 3rd, Osment LS. Nail pigmentation abnormalities. Their importance and proper examination. Cutis. 1980 Jun. 25(6):595-607. [Medline]. Assadi F. Leukonychia associated with increased blood strontium level. Clin Pediatr (Phila). 2005 Jul-Aug. 44(6):531-3. [Medline]. Dasanu CA, Wiernik PH, Vaillant J, Alexandrescu DT. A complex pattern of melanonychia and onycholysis after treatment with pemetrexed for lung cancer. Skinmed. 2007 Mar-Apr. 6(2):95-6. [Medline]. Tosti A, Schneider SL, Ramirez-Quizon MN, Zaiac M, Miteva M. Clinical, dermoscopic, and pathologic features of onychopapilloma: A review of 47 cases. J Am Acad Dermatol. 2016 Mar. 74 (3):521-6. [Medline]. Pucevich B, Spencer L, English JC 3rd. Unilateral trachyonychia in a patient with reflex sympathetic dystrophy. J Am Acad Dermatol. 2008 Feb. 58(2):320-2. [Medline]. Arsiwala SZ. Idiopathic acquired persistent true partial to total leukonychia. Indian J Dermatol Venereol Leprol. 2012 Jan. 78(1):107-8. [Medline]. Farooq M, Kurban M, Abbas O, et al. A novel mutation in the PLCD1 gene, which leads to an aberrant splicing event, underlies autosomal recessive leukonychia. Br J Dermatol. 2012 Mar 28. [Medline]. Clayton N, Atkar R, Verdolini R. Ten bright-white fingernails in two young healthy patients. Congenital total (patient 1) and subtotal (patient 2) leuconychia (white nails syndrome, or milky nails). Clin Exp Dermatol. 2012 Mar. 37(2):201-2. [Medline]. Hasunuma N, Umebayashi Y, Manabe M. True leukonychia in Crohn disease induced by selenium deficiency. JAMA Dermatol. 2014 Jul. 150(7):779-80. [Medline]. Morin G, Desenclos C, Jeanpetit C, Lévy N, Deramond H, Mathieu M. Additional familial case of subtotal leukonychia and sebaceous cysts (Bauer syndrome): belong the nervous tumours to the phenotype?. Eur J Med Genet. 2008 Sep-Oct. 51(5):436-43. [Medline]. Kim SW, Kim MS, Han TY, Lee JH, Son SJ. Idiopathic acquired true leukonychia totalis and partialis. Ann Dermatol. 2014 Apr. 26(2):262-3. [Medline]. [Full Text]. Lin Z, Zhao J, Nitoiu D, Scott CA, Plagnol V, Smith FJ, et al. Loss-of-function mutations in CAST cause peeling skin, leukonychia, acral punctate keratoses, cheilitis, and knuckle pads. Am J Hum Genet. 2015 Mar 5. 96 (3):440-7. [Medline]. White, transverse, horizontal lines are observed on 4 fingers of a 49-year-old man with adenocarcinoma in his rectosigmoid and adenoma in his sigmoid found in May 2002; he was treated with preoperative radiation and 4 continuous infusions of 5-fluorouracil at the same time. White transverse bands are seen on all 10 fingers. Horizontal white bands are seen on all 10 fingernails. Close-up view. White horizontal bands are evident.